Former Vice President and Republican Gubernatorial candidate Richard M. Nixon debates the 1962 California Gubernatorial election with his Democratic opponent and current California Governor, Edmund G. (Pat) Brown. The 1960 Presidential Election is told in this TV adaptation of Theodore H. White's Pulitzer Prize winning Best Seller. Covered are the John F. Kennedy-Lyndon Johnson confrontations, Adlai Stevenson and Nelson Rockefeller platforms and highlights of the Kennedy-Richard M. Nixon TV debates. Originally broadcast Dec. 29, 1963. Martin Gabel narrates. Former Vice President Richard M. Nixon introduces the Republican Presidential nominee Barry Goldwater who gives his 40 min. acceptance speech. Also heard is "America The Beautiful" sung by the convention chorus. President Richard M. Nixon talks to the American people from the White House in Washington, D.C. The main topics are the new proposals and initiatives to be taken in Vietnam, where there have been American servicemen killed in action since 1965. Howard K. Smith reacts to the speech. With thousands of student demonstrators massing in Washington for a mammoth peace rally, President Richard Nixon tells a late evening news conference that he agrees with everything they are trying to accomplish. #6220: PROTEST DEMONSTRATION IN WASHINGTON D.C. Protesters react to President Nixon's press conference held the night before. They stage a peace rally. Live coverage of the funeral of former FBI Director J. Edgar Hoover. The Eulogy is delivered by President Richard M. Nixon. The American Film Institute premieres this annual event by honoring Mr. John Ford. 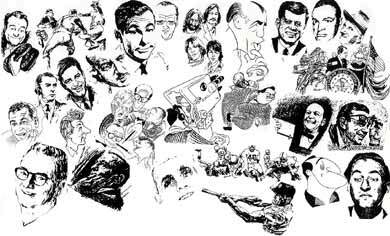 President Richard M. Nixon is among the notables paying tribute along with Charlton Heston, Jack Lemmon, Maureen O'Hara, Gregory Peck, Frank Sinatra, James Stewart and John Wayne. Danny Kaye is host. Joined in progress from Washington D.C., President Nixon announces new Phase 4 controls and a freeze on all retail prices for a period of 60 days. Howard K. Smith, Harry Reasoner and Frank Reynolds give analysis during this Congressional first night of hearings in the Richard M. Nixon impeachment case. Illinois Republican Congressman Tom Railsback and others are heard. Railsback is interviewed by Sam Donaldson on the floor of Congress. Summary of the day's impeachment proceedings. Aired from 7:30-8:05pm NYT - Live from LA, President Nixon discussed the state of the American economy in an address at the Century Plaza Hotel in Los Angeles, also discussing his plans for the future in controlling the inflation and guiding the American economy. Summary of the House Judiciary Committee's Debate on the Articles of Impeachment; SPECIAL. Joined in progress. Related to today's impeachment hearings. House impeachment hearings related to Richard M. Nixon. 10:30 AM through entire day. Impeachment hearings of Richard M. Nixon are held and recorded at different times. Live coverage of President Richard M. Nixon's resignation on NBC Radio, beginning at 2PM through midnight, complete. Includes President Nixon's resignation speech at 9PM and a special retrospective, "The Nixon Story." President Richard M. Nixon gives his farewell speech. Joined in progress at 9:30 AM.